Nuts Manufacturers in India. Buy Top Quality Hex Nuts or Heavy Hex Nuts at Best Prices! 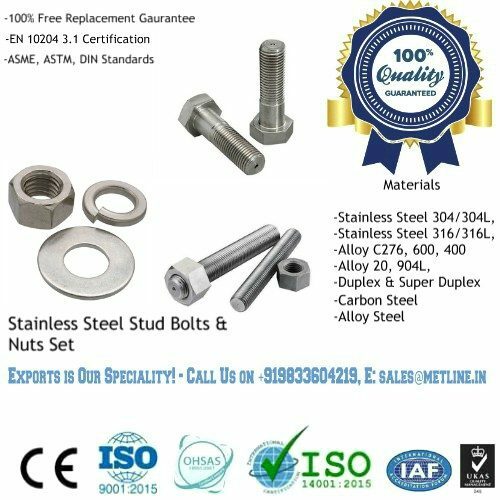 ASTM A194 – This specification covers carbon, alloy and stainless steel nuts intended for use in high-pressure and/or high- temperature service. Unless otherwise specified, heavy hex nuts (ANSI B 18.2.2) shall be used. Metline produces premium quality nuts, hex nuts and heavy hex nuts in a wide range of grades and sizes and in accordance with ASTM/ASME/DIN standards and specifications. We produce both hot forged nuts and cold formed nuts in almost all shapes & sizes. The common standard of ASME/ANSI Hex Nut is ASME B18.2.2, which includes normal hex nut, hex thin nut, hex thick nut and heavy hex nut. These nuts manufactured by Metline are intended for high-pressure or high-temperature service, or both. Metline is a specialized manufacturer and supplier of low carbon steel (mild steel), carbon steel, alloy steel, stainless steel and brass, aluminium alloy nuts. For greater strength and corrosion resistance in nuts, we can also process the materials further such as heating, black oxide, zinc coating, hot dip galvanizing, black zinc coating, brass coating, nickle and chrome plating, dacomate, etc. 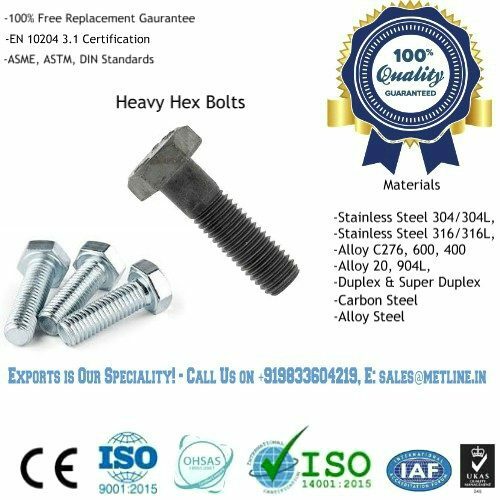 We can offer fastest delivery for hex nuts and heavy hex nuts manufactured as per DIN 934, DIN 6923, DIN 1587, DIN 928, DIN 929. 304 (B8), 316 (B8M), 316 L, 316 Ti ,317 L, 310, 321H (B8T), 347H (B8C), SS 410 (B6) , 904 L (UB6) , A453 GR 660 A/B/C & D.
UNS S31803 / UNS S32205 (F 51), UNS S32750 (F 53), UNS S32760 (F 55), UNS S31254 (SMO 254). Monel 400 , Monel K 500, Incoloy 600, Incoloy 625, Incoloy 800H, Incoloy 825, Incoloy 718 , Inconel X – 750, Alloy 20 (CB 20) , Hastelloy C 276 , Hastelloy C 22, Hastelloy C4. Titanium Gr 2, Titanium Gr 5, Aluminium Bronze (AB 2) , Phosphorous Bronze (PB).